Session 343. Great kitesurfing in a late sea breeze. After carefully negotiating the barrage of learner kites on the shore I headed out. I saw Stuart downwind as I passed the end of the breakwater. I was on a good tack and nicely powered so I kept going - a tour eventuated. I crossed the Spirit of Tasmania channel - the ship was still at the wharf - and kept going until I came to the main channel markers. Then I turned and headed back upwind of the St Kilda harbour breakwater, coming up close the beach. I followed the breakwater back to open water and did some nice slalom turns to get back in. I did a few runs in the kiddy pool wary of shallow water and the many boats on swing moorings. Lovely light with the sun going down. But the water is not very clean . . . Overall, another very nice session. Session 341. More nice kitesurfing in a cool southerly wind with my Lithium 9 and trusty North Nugget. The wind was stronger further out so I did a long run out and back. There were a lot of large yachts racing a course off Hampton and some smaller ones further out. Stuart and James were out too. The wind was up and down a bit but the Nugget makes it easy to cope with the lighter patches. My hands were fine so all is good. Except that I couldn't find my bar - I may have left it at Hampton on 18/11. If you find it please contact me! Beer will be provided. Its so good to be kitesurfing again. Kite + wind + board + water = cabin fever cured! Yabba dabba doo! Session 340. Back on the water again at last! My hand injuries have healed, but getting my left little finger bending properly is taking some time. Last week, the surgeon and hand therapist gave me a tentative go ahead for the weekend but said "it would be better to wait another week before kitesurfing". 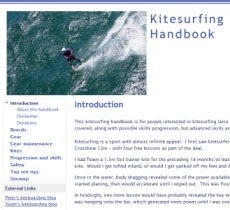 I had commitments on Friday and during the weekend so I missed out on the lads kiting weekend at Sandy Point. However, conditions were good late on Sunday afternoon so I headed for Hampton to be greeted by a glorious sea breeze and uncrowded water. It felt so good to be out again powered up on the Lithium 9 and Nugget. My right thumb was fine and I think the session helped bend my left little finger further. This was the first time I used my new NP helmet - it is lighter that the Protec and very comfortable. I did some long tacks to get back into the groove after 8 weeks off the water and a few small jumps. Gybe turns were no problem but I was a bit rusty on the waves. It soon clicked and I rode some nice rollers out in the Bay and a couple of good waves over the reef in the middle of the two groynes. The combination of water, waves, wind, board and kite really is unbeatable.